Ok, when it started out small.. I was thinking "fernlike", and started to wonder if it was more of the q.a.l. I have everywhere. But now, it's gotten much bigger, and it's definately not looking like the q.a.l. and there's funny looking cone shaped things at the top now. It's about hip high to me.. maybe 3' tall? EVILLLLLL!!! NOOOO!!! IT MUST DIE!!!! Going to hack it out today! I thought ragweed was that other UGLY thing I have.. LOTS of LONG clusters of seeds.. I'll have to photo those for ya. AAAAAHHHHHHHHHHH choooooo! But I do keep a few around in my "Garden weed Patch"...for the Black and Yellow Argiope / Orb Spider I just love them... they like Japanese Beetles..
And they are just down right cooooool to look at. The kids love to find them in there..
We usually don't see much of them until late summer/fall time.. I saw one of those spiders at my friend's house one day, in her backyard. Actually, really close to her back door. There were also 2 egg sacs. I was kinda freaking out, & told her she should try to get rid of it.. it was so big & scary looking! But, she calmly explained she was a helpful garden spider, and wouldn't bother us. Still. They are sooooo big! But you're right, they are neat lookin. They look like they have an Alien on their backs!! Meg and Mary -- don't be embarrassed about not knowing it was ragweed. When I first came to this forum, I put up pictures of my ragweed - called it 'this little ferny thing'. Ha ha! I still like it though - I'm guilty of having it in my rock garden and other little spots. Don't burn it I've heard it smells like marajuana. My hubby says it don't look like ragweed to him. Maybe our ragweed don't grow to 3 or 4 ft. in Ok.
Oh, burn it, burn it . . .
i think i've got some of that growing in with the peony that i transplanted from the neighbors yard. asked my friend what it was & she said something - some kind of geranium? can't remember what she called it - but she was sure that it was a plant and not a weed. 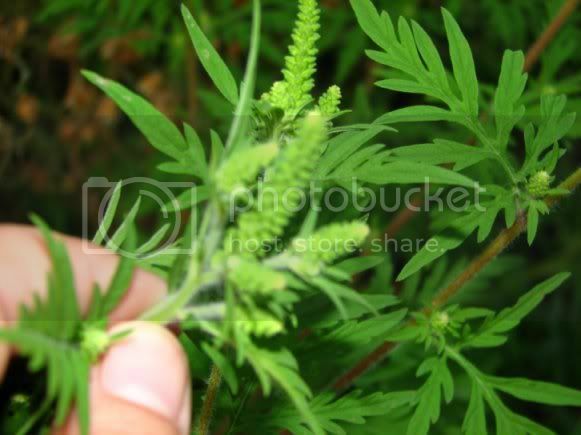 Here's another picture of ragweed. 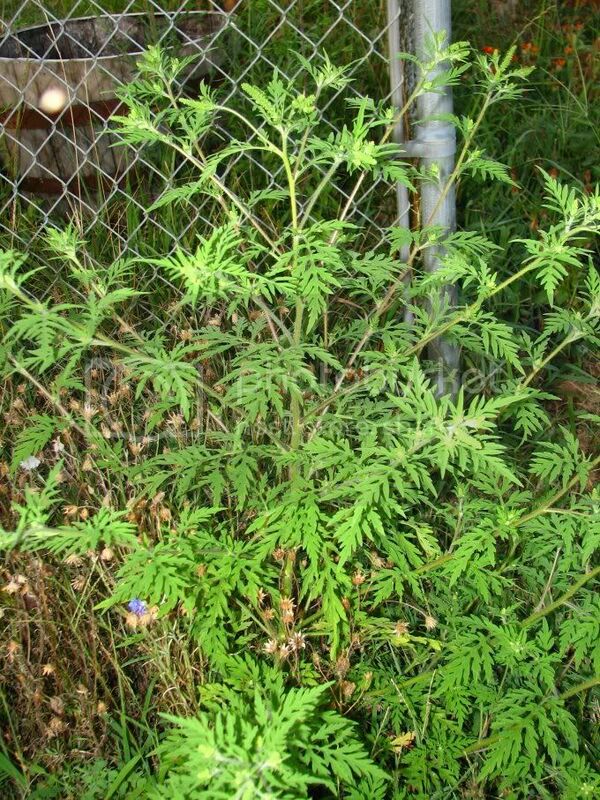 I always thought ragweed and the stuff I call horse weed were the same thing. Horse weed is the one with much bigger flowers. Just goes to show you, there is always something new to learn in the garden!!! I love those orb spiders too. I have 2 in my yard right now. Hopefully they will make many babies and eat up all the Japanese Beetles next year!!!! weezie, awesome spider link! i have those around here, i'll have to show scott and matthew the link so they will leave them alone.